Angela was born and raised in Lebanon, PA, and has always resided in the area. 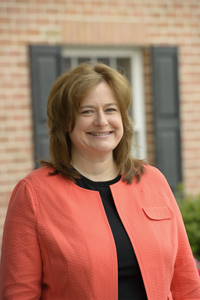 She attended Lebanon Valley College and earned her Bachelor of Science in Professional Accountancy from Penn State University in 1989 and passed the CPA exam in 1991. Angela began offering investment professional services in 2005 to better serve her tax and accounting clients. In 2010 Angela became a partner at Garcia, Garman & Shea, P.C. with offices in Lebanon and Lancaster. It was here that Angela became acquainted with Ambassador Advisors. Their hands on, customer service oriented attitude so impressed her that she joined their team in 2012 and looks forward to a long relationship with Ambassador for both her and her clients. In her free time Angela enjoys reading, music, theater and playing tennis as well some get-away time in North Carolina’s Outer Banks. Angela is a member of Cornwall United Methodist Church and lives in Mt. Gretna with her husband and three daughters.